Weird and Offbeat Sites - The Skull Cathedral in Otranto. Otranto is a pretty seaside town in Salento, a region in southern Italy. With an impressive castle, fortified medieval walls and a majestic view of the Adriatic Sea, you’d never guess this town contains a cathedral with a dark and mysterious past. 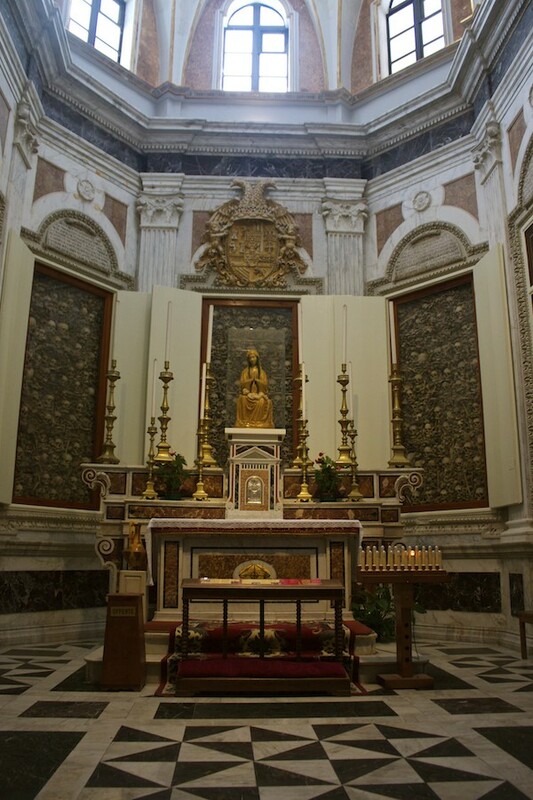 The Otranto Cathedral, or “Skull Cathedral” as some call it, is almost a secret. Otranto remains mostly free from tourists so not many know about this cathedral which houses a rather morbid and disturbing altar of human skulls. 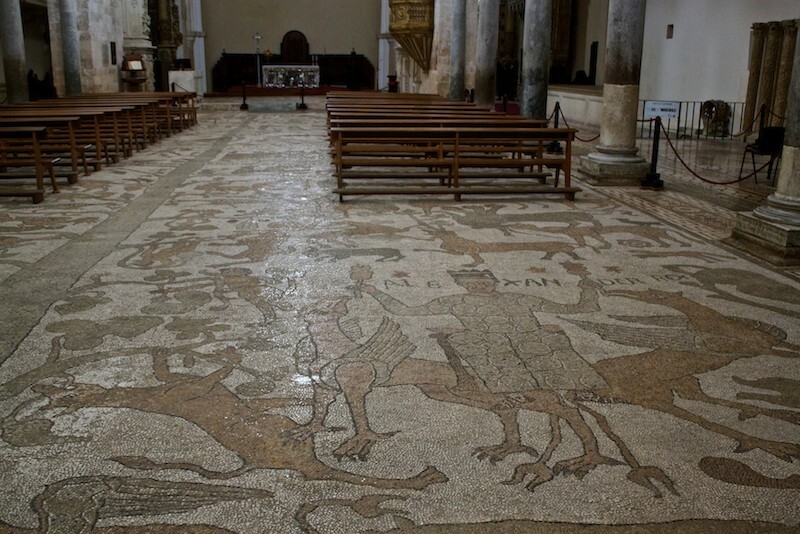 There’s also a large tile mosaic that spans the entire floor of the cathedral with a bizarre menagerie of images that have scared the pants off invading Ottomans, puzzled scholars for centuries and earned the attention of Dan Brown, author of the Da Vinci Code. Friends, let’s learn more about this weird and offbeat site together. 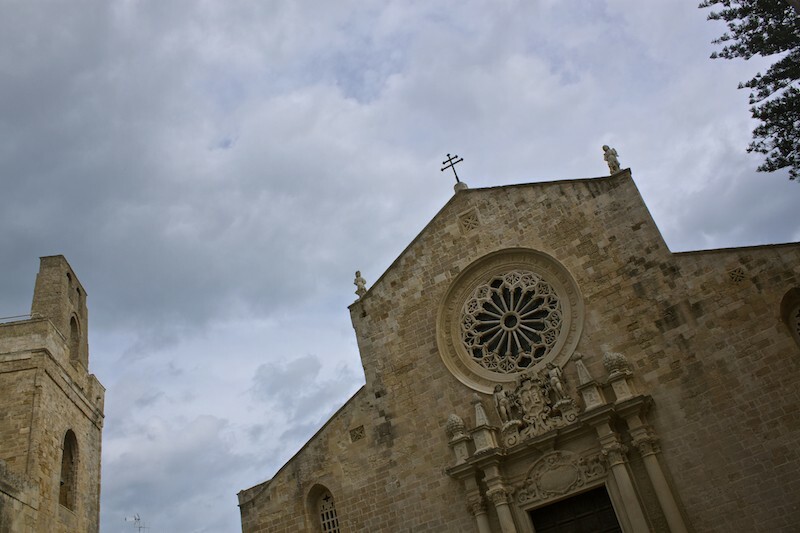 From the outside, Otranto Cathedral appears similar to gazillions of other duomos around Italy. Consecrated in 1088, this cathedral is more understated than some; its most striking detail being an ornate Renaissance rose window. The neighbouring 12th-century bell tower is all that’s left of a taller structure that used to be a lookout to spot any attacking enemies. These days, the bell clamours to wake the sleepy town and invite those around to visit and experience one of the most unique cathedrals in the world. Some have even gone so far as to call it the scariest cathedral in the world. At first glimpse, the interior of cathedral doesn’t seem like anything to make a fuss over. You need a moment to absorb what’s around you. Looking up, you may hurt your neck from straining to see the meticulously detailed, 17th-century coffered Moorish ceiling. I agree. The possibly high or intoxicated genius behind this mad work of art was Basilian monk Pantaleone, commissioned to build the mosaic by Archbishop Gionata. Spanning 16 meters from the entrance to the altar, the mosaic depicts a Tree a Life with a long trunk extending out into several smaller parallel branches (there are also two more trunks that span the aisles). The Tree of Life is said to reflect the journey of humans from the Fall to Salvation, the battle between good and evil that defines our earthly present and spiritual future. The mosaic has a collection of unrelated images that make it difficult to understand the overall message. As expected, there are biblical scenes from the Old and New Testaments but then there are fabled animals like unicorns, bearded centaurs and winged griffins. Alexander the Great and King Arthur make appearances, too. The roots of the tree rest on two elephants, one male and the other female. 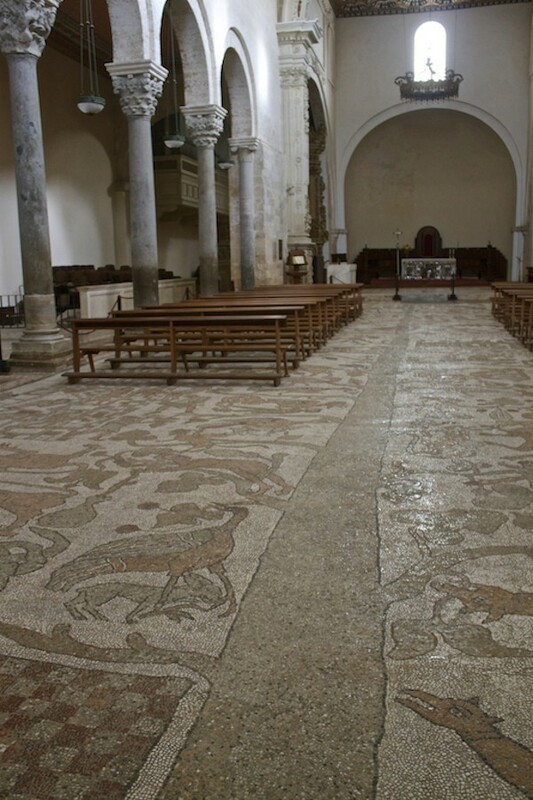 Say what you will about this masterpiece, but when attacking Ottomans roughly and mercilessly sacked all of Otranto and knocked down the walls of the cathedral, they left this floor intact. 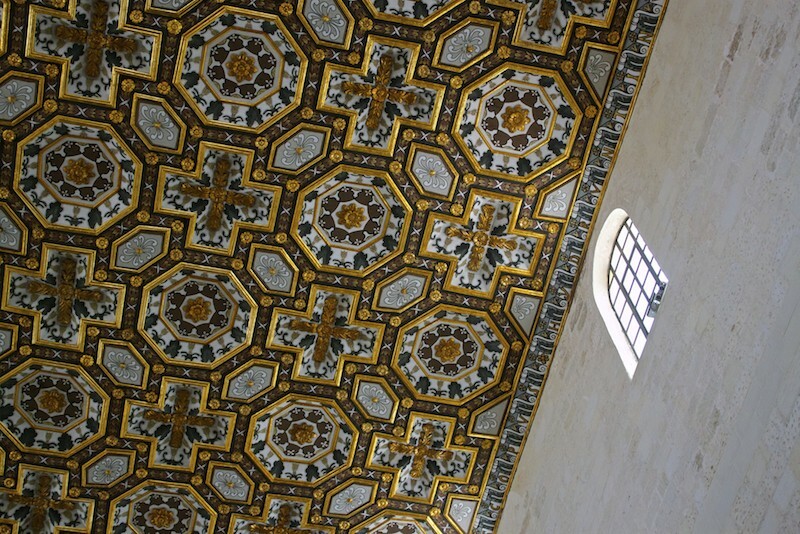 The powerful mosaic was something the Ottomans feared and hesitated to destroy, but unfortunately the same rule did not apply to the town and its residents. It was in 1480 that 18,000 invading Turks launched a full-blown assault on Otranto. The residents fought bravely and managed to hold their enemies back for about 2 weeks but were finally overcome. It’s said that over 12,000 people were killed and 5,000 others sold to slavery in Albania. Without Daenerys Targaryen and her three fire-breathing dragon children around to defend them (seriously, this battle reads like a page from a Game of Thrones novel), about 800 survivors of the siege took refuge in the cathedral, including clergy, women and children. They were to be given clemency if only they agreed to convert to Islam. Twice refusing, all of them were slaughtered and decapitated by the Turks at nearby Minerva Hill. As such, these people came to be known as the Martyrs of Otranto. The Turks destroyed the cathedral and turned it into a mosque. 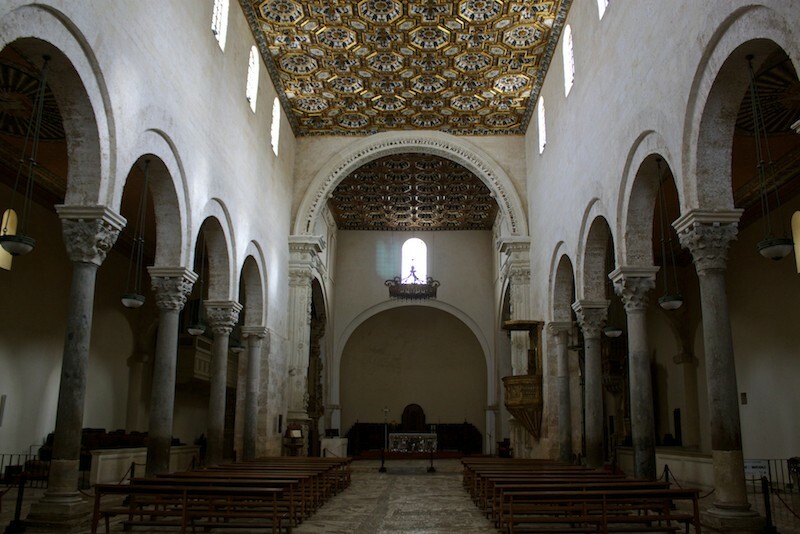 Then in 1481, a mere year later, the Italians took back the town and turned the mosque into a cathedral again. Shortly thereafter, a special area was built to remember those lost – this is where you can now see the remains of those 800 Martyrs and their skulls and bones. 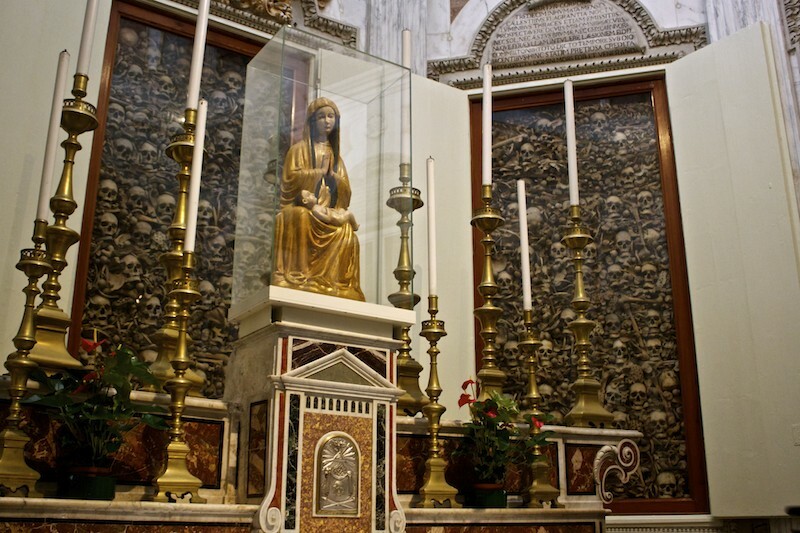 The martyrs were beatified in 1771 and then canonized by Pope Francis in May 2013 making them freshly sainted! 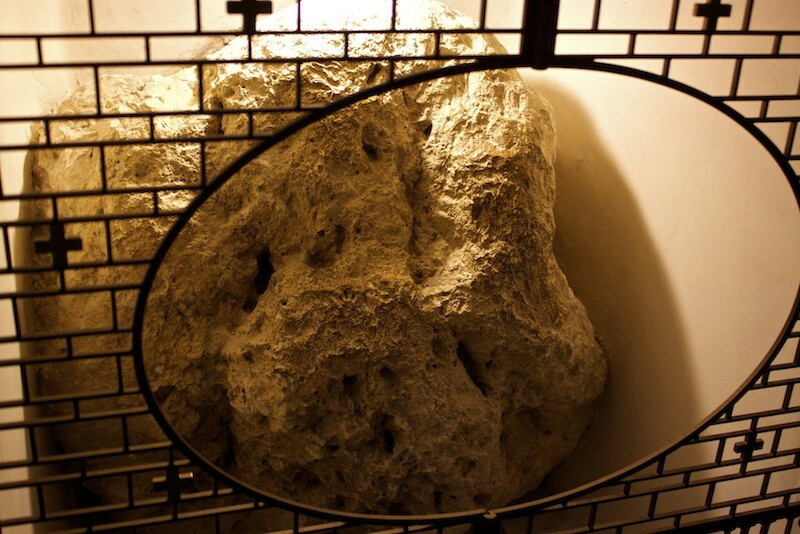 This rock was the rock used to decapitate the martyrs and it now serves as a very grim and brutal reminder of the tragedy that happened during the invasion of Otranto. Scholars have come to question this story of the martyrs, claiming they were not murdered for denying a conversion to Islam but for putting up a good, hard fight. It’s thought that they were murdered in a savage fashion to deliver a strong message to others who may dare to fight any more oncoming advances. Regardless of what you believe about the meaning of the Tree of Life or the reasons behind the killing of those 800 people, the Otranto Cathedral is pretty much one of the most interesting places you can visit in Salento. 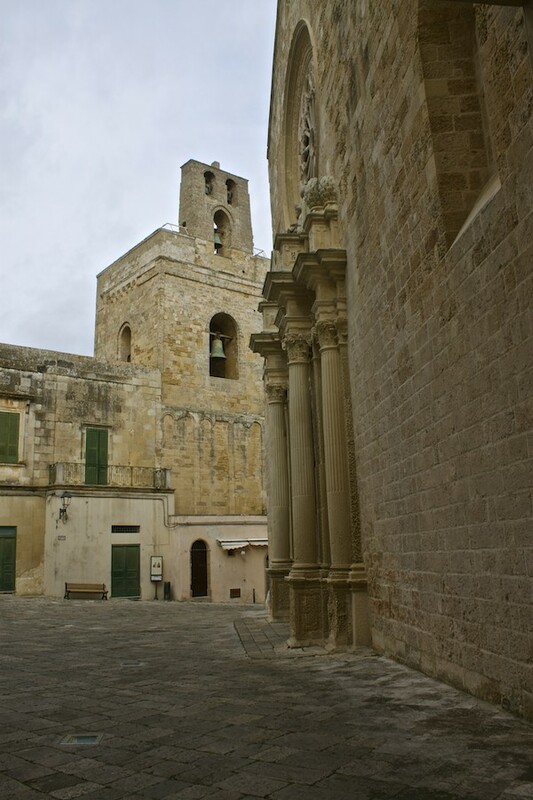 1) Otranto isn’t far away from other towns in Puglia. Read all about my stay in Brindisi and my visit to Monopoli. 2) Other points of interest in town are Otranto Castle and well, the Adriatic. Go for a swim or take a long boat ride in that big, blue, beautiful sea. Eat seafood or buy pasta from local shops – I brought home some orecchiette! 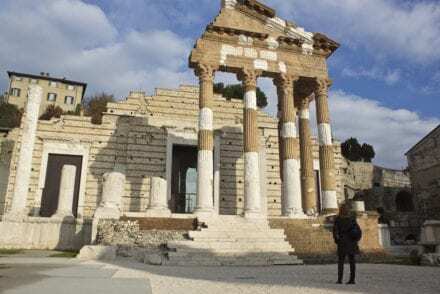 * Disclosure – My time in Salento was complimentary, courtesy of Agrifeudi. Any opinions expressed about my love of all things weird and offbeat are entirely my own. 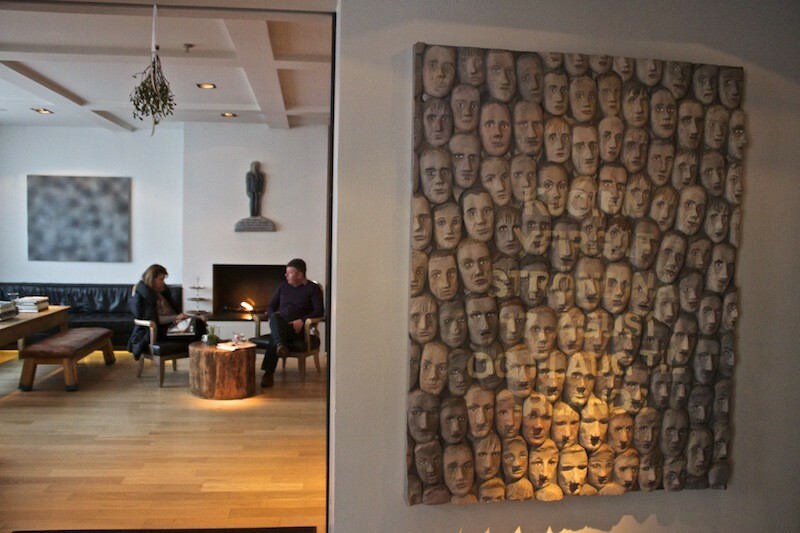 Iceland Hotels – 101 Hotel in Reykjavik. 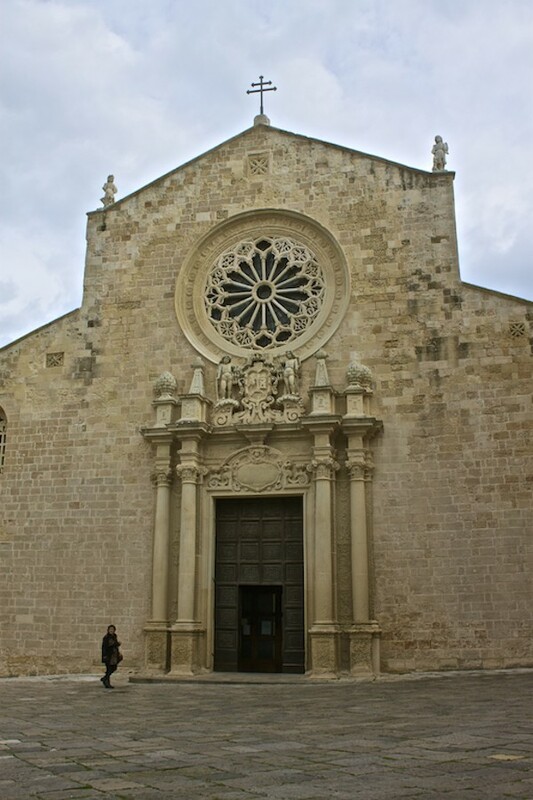 I’ve been to Otranto and the cathedral. You’ve portrayed it so well with your descriptions, historical information (I like your “Game of Thrones” reference) and photos. Definitely a little scary there, but isn’t that ceiling amazing? You’re right, that ceiling is really something to behold. This cathedral and all the weird and wonderful things about it really stick with you after you leave too. I want to spend more time pondering the craziness of that floor! I so agree with you on this! Yes, this cathedral is weird and certainly more than a little scary. It sounds really scary, weird but interesting place to visit. I would like to suggest you that there is a same type of tunnel museum in Paris city called as “The Catacombs Of Paris”. Your post, images and written text reminds me this place. I would suggest you have this place once for more scary experience. Love it Cheryl – so many great cathedrals to enjoy for architecture and MORE! Just followed you on Twitter so I can check out more weird and offbeat sites – as well as the not-so-strange ones 🙂 Maybe see you there sometime! It’s very fascinating! Thanks for stopping by the blog and for the follow. This looks like a really interesting cathedral. Something I’d imagine in one of Dan Brown’s books. Very intriguing story behind this cathedral. It must have felt weird to be there! Thanks for sharing! Hey Mary – I did not feel weird at all and was just fascinated by the history. It was incredible! If I ever visit Otranto, this place is going to be on top of my list. It sounds so fascinating, yet terrifying. Thank you for the detailed information.